Rinse and pick through the dried soybeans. Soak in plenty of water overnight or for 8-10 hours. When they are re hydrated, rinse them once more. Grind the soy beans in the food processor in 2 cup batches. Cover the beans with a little water and grind for 4-5 minutes until they are pureed and have turned white. They will have the consistency of cream of wheat. Put half of the ground soy beans into each pot. Divide the 1 gallon of water between the pots. Bring to boil and lower to simmer for 15-20 minutes. Watch the pots carefully as it tends to boil over. There may be a lot of foam -- you can remove it or stir it in. When it has simmered for 15-20 minutes turn off the heat and strain. Ladle the liquid into the strainer with the cup or bowl under it. The ground soy beans, or okara, will collect in the strainer. Remove this to a colander lined with cheesecloth. Squeeze all of the soy milk out of the okara. Wash one of the pots, pour all of the soy milk into it and take it back to the stove top. Using your thermometer, warm the soy milk to 180 degrees. Dissolve the nigari in 1 cup of hot water. When the soy milk reaches 180 degrees, turn off the heat. Gently add the nigari mixture and stir. Turn the heat back on and gently stir until the soy milk separates -- like curds and whey. If it doesn't separate, make a small batch of nigari (1 1/2 tsp to 1/2 cup of hot water) and add it in. Stir gently. The water will turn clear and the curds will clump. Ladle the curds and whey into the muslin- or cheesecloth-lined tofu press. Cover the tofu with the cloth and drop in the lid. Put a 3-5 pound weight on the top (large jars of tomatoes, pitcher of water, etc.) and let it sit for 20-30 minutes. The longer its pressed, the firmer the tofu. 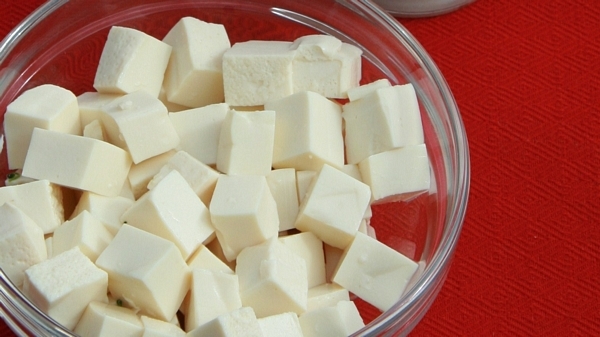 Remove the cloth and place the tofu into a container. Cover with water and put on a tight fitting lid. It will keep for a week; change the water every day or so that it stays fresh. Use the okara (the soy pulp) in burgers, bread or muffins.